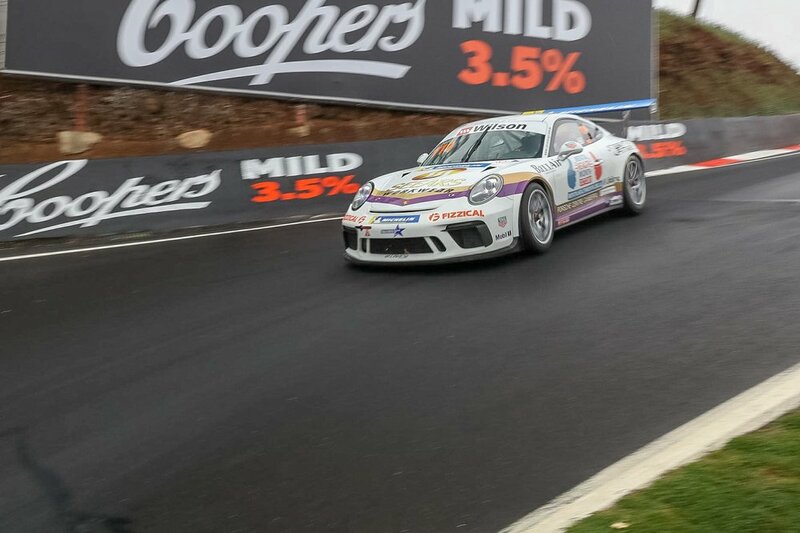 A wide-eyed Cameron Hill has described today’s Porsche Wilson Security Carrera Cup practice and qualifying conditions at Bathurst as some of the most challenging he has ever encountered. The Mount Panorama circuit was buffeted by moderate to heavy rain for much of the day, and Hill said the adverse conditions challenged drivers and teams alike. “In the practice session, it started out very damp but it gradually dried out as the session progressed,” Hill said. However, the rain returned for qualifying and Hill was faced with a completely wet circuit – he qualified 10th. “The grip levels were low and the spray was insane; fortunately I was able to find some clear track, because the visibility was quite bad when I was following other cars. “The car was good, we brought it home in one piece, and our times weren’t far away from the front-runners. The weekend’s opening race will start at 2:05 tomorrow afternoon.